Specifically designed for ski touring, the Touring Shield Jacket from Millet provides an excellent balance between breathability and protection. Constructed with wicking-treated Polartec® Powershield Light and Stretch fabric, the jacket features large underarm zips and core-venting chest pockets to keep you from overheating and soaking in your own sweat. It's also designed to protect your from the elements with the DWR treated nylon exterior and added features like a protective visor on the hood. Millet cut the Light & Stretch version of Powershield into an active fit that pivots naturally when skiing or touring. Polartec Powershield fabric is an extremely tough nylon exterior with a polyester velvet interior. Flex Comfort™ ergonomic build with pivot sleeves is designed to move with you in the mountains. 2 large chest pockets can be used to stash skins or dump any excess heat or moisture. Integral hood with protective visor offers panoramic vision while keeping out falling snow. Large underarm zip vents are useful when you're going full board uphill and want to dump some heat quickly. Quick access pocket on the left sleeve is great for gels, maps, and anything else you need to access on the go. Treated with Durable Water Resistant to give a waterproof rating of 166 g / m². Treated with a wicking agent on the interior that helps shuttle excess moisture outside. Option to match with the Touring Shield Pant. This is a review of the Men's Millet Touring Shield Jacket, which may have just sold out at Skimo since I don't see the men's available for a review. Perhaps it's also pertinent to the women's jacket. 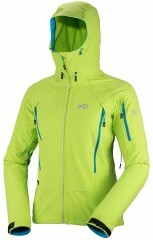 This is an excellent touring jacket and depending upon weather and race, may be very suitable for skimo racing. It is lighter and more versatile than any other shoftshells I've used. I used the jacket everyday for a week in the Andes. Temperatures were usually 15-30 F, some days overcast, snowy and windy, some blue bird with lots of solar gain. Two things really impressed me about the jacket: comfort range and lightweight. Except for brief periods during cold dawn, I only wore a lightweight wool base layer and buff under the jacket everyday for a week in snow, wind, or sun. The green also has exceptional visibility, with a few reflective pieces to aid identifying your team mate during night races. The hood will fit over my CAMP race helmet, but it's tight. Quality appears to be at least good. I used it instead of my '11 vintage red/black Dynafit PDG race jacket, which is more of a light insulating layer where the Neo is more of a shell. Neo weighs about 40-gms more than PDG, cuts wind much better and is warmer when you need it to be. Both are equally comfortable when you're trying to ventilate and cool without loosing the wind protection. Neo will shed water much better. The Neo's zippered deep pockets holds skins, snacks, water bottles more securely than the old-style open top pockets.